We don’t really know how many Tesla Model 3s were sold in the USA in January and February, but the car should be in the top 20. 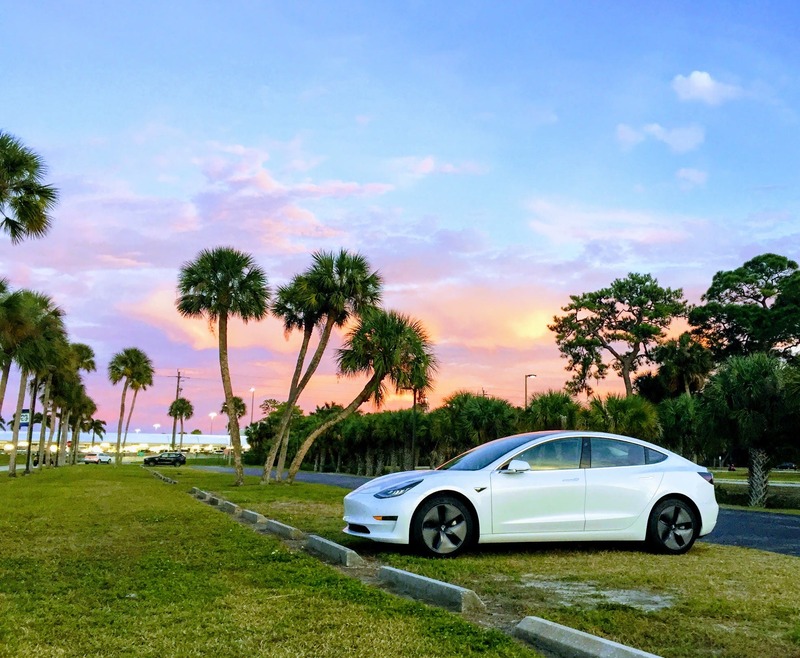 With less than one day remaining to order the Model 3 Standard Range Plus for $37,000, I felt we still hadn’t done enough to compare the current Model 3 options with the other top selling cars in the USA. So, here’s a new comparison focused on one key topic: 5 year total cost of ownership. 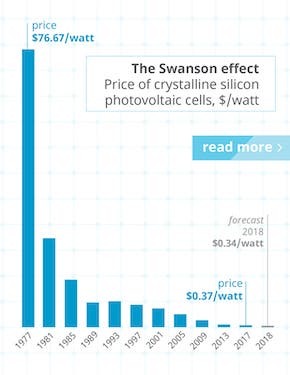 These costs are estimates, of course, based on averages, extrapolations from Tesla Model S data, and heaviliy utilizing the Edmunds total cost of ownership calculator. The actual results will vary depending on individual circumstances. 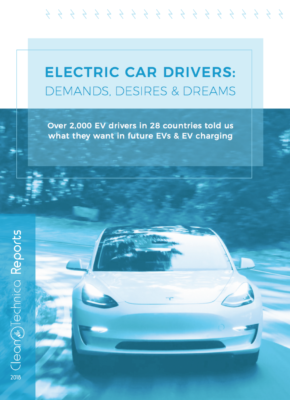 For more background on the Model 3 assumptions, see this article. Worth noting before looking at the cost comparison is that the Tesla Model 3 is much safer than any of these other top models (based on NHTSA tests), much quicker than any of these other top models, and has a totally different drive quality — a much better drive quality that even beats the drive quality of top luxury cars. With all of that in mind, jump into the details (which I’m embedding as a table and then also including in image format with a color gradient that highlights cost differences). With those bulk summary numbers out of the way, I’ll briefly compare the Tesla Model 3 to the 7 best selling cars in the US. I won’t run through the rest of the top 10 list since the comparisons would be rather repetitive, but you’ll get the picture. The Toyota Corolla is a cheap car. It feels cheap, drives like it’s cheap, and everyone knows it’s cheap. Over 5 years, the base Corolla is expected to be a bit more than $7,000 cheaper than the base Model 3, or about $122 a month cheaper. I guarantee you — the Model 3 feels like it costs much more than a $122/month premium over the Corolla. The interesting thing is, if $122/month matters that much to you, you should not be buying a new car anyway. It’s a horrible way to spend your money. It would make much more sense to get a used car at a much lower price. 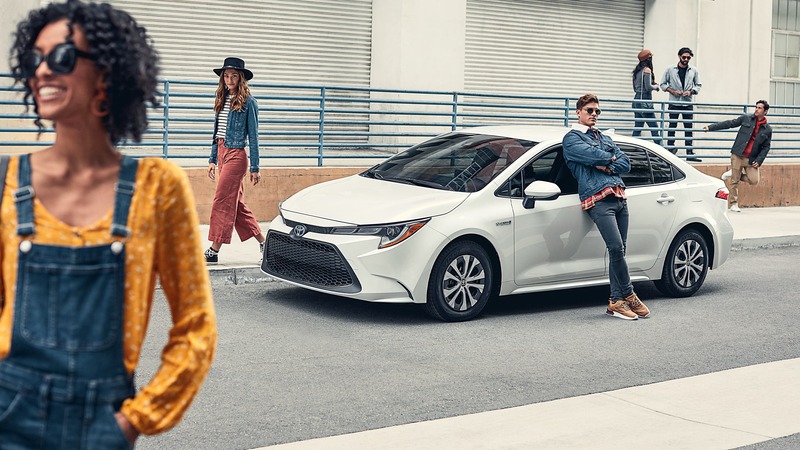 54,129 Toyota Corollas were sold in the first two months of 2019 in the US, up 16.6% compared to January–February 2018. The Camry is a step up from the Corolla, but still a big step down from the Model 3 with regards to … almost everything. Interestingly, a base Camry is just ~$4,000 cheaper than a base Model 3 over 5 years (or ~$67 cheaper per month), the higher end Camry XLE is more than $7,000 more expensive than the Model 3 Standard Plus, and the higher end Camry XSE is more than $8,000 more expensive than the Model 3 Standard Plus. I’ll repeat what I’ve said before — anyone who is buying a Camry instead of a Model 3 doesn’t understand what a Model 3 offers and costs. 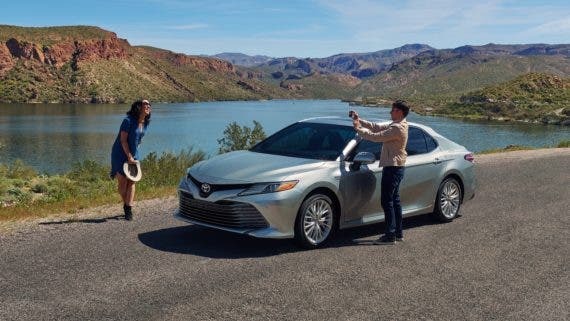 48,069 Toyota Camrys were sold in the first two months of 2019 in the US, down 13.4% compared to January–February 2018. 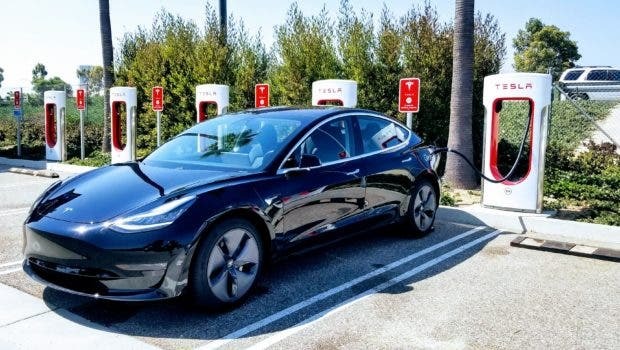 This is perhaps the model I thought would be most compelling as a continued option versus the base Model 3, due to what I presumed would be a low total cost of ownership. As it turns out, even the lowest cost Honda Civic sedan only saves you about $104 per month compared to the base Model 3. Seriously? I knew it was now more or less nonsensical to buy a Honda Accord instead of a Tesla Model 3, but that’s apparently the case for the Honda Civic as well! Recall that the Tesla Model 3 is much safer than the Honda Civic, much quicker, has much more tech, and has much better drive quality. 44,532 Honda Civics were sold in the first two months of 2019 in the US, down 10.15% compared to January–February 2018. The Accord was a great model, but unless something changes dramatically, its days should be numbered. It is simply uncompetitive with the Tesla Model 3. In fact, a few versions of the Accord sedan are more expensive than a Tesla Model 3 Standard or Standard Plus (for a few more hours, at least). There’s no way in hell someone should buy any Accord over a Model 3. Even the lowest cost Accord sedan saves you only $43 a month over a Model 3 Standard. Honestly, I feel sorry for anyone who buys that Accord instead of a Model 3 — what a shame, and must simply be due to lack of awareness. 39,040 Honda Accords were sold in the first two months of 2019 in the US, up 4.3% compared to January–February 2018. You can save $6–69 per month buying a Nissan Sentra vs. a Tesla Model 3. Why would anyone do that to themselves? 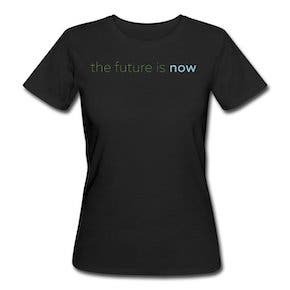 Masochism is one option, but the much bigger one is lack of awareness. 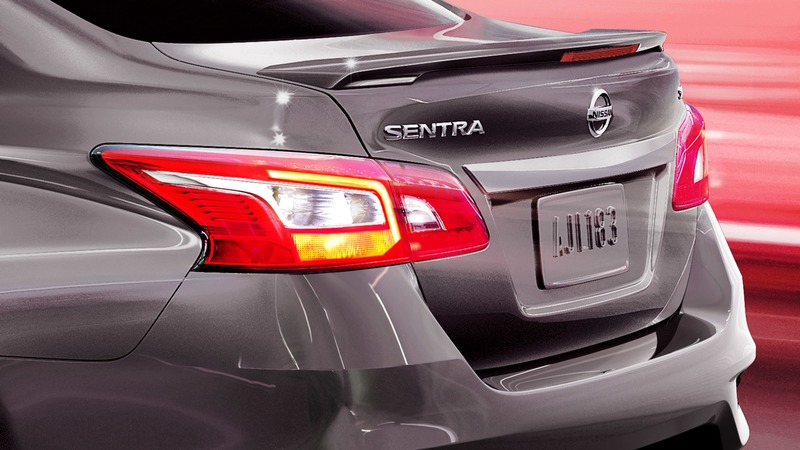 Friends don’t let friends buy Nissan Sentras. Make sure you share this comparison with anyone you know who might be making such a mistake. 31,160 Nissan Sentras were sold in the first two months of 2019 in the US, down 10.7% compared to January–February 2018. In the case of the Nissan Altima, you’d actually spend more money over five years than you would with a base Model 3 unless you got the much lower quality bare bones Altima in order to save $19 a month. Actually, even if you chose the Model 3 Standard Plus, you’d save money compared to buying the Altima SV, SR, and SL. 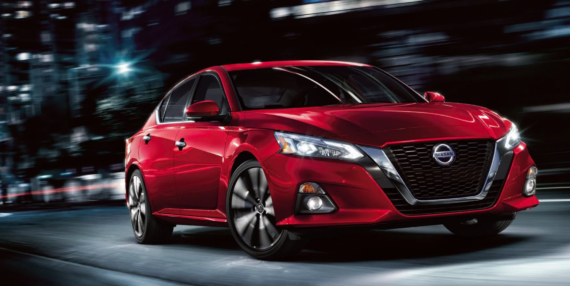 28,405 Nissan Altimas were sold in the first two months of 2019 in the US, down 28.8% compared to January–February 2018. I recently rented a Hyundai Elantra. Ugh, this car is horrible! The driving experience made me feel like the car was broken, made in the 1930s, or actually a tractor underneath. The doors were super flimsy and cheap. The interior was “meh.” There’s no way I’d ever buy a Hyundai Elantra instead of a Tesla Model 3 just to save $7–129/month over 5 years. No one else should either. 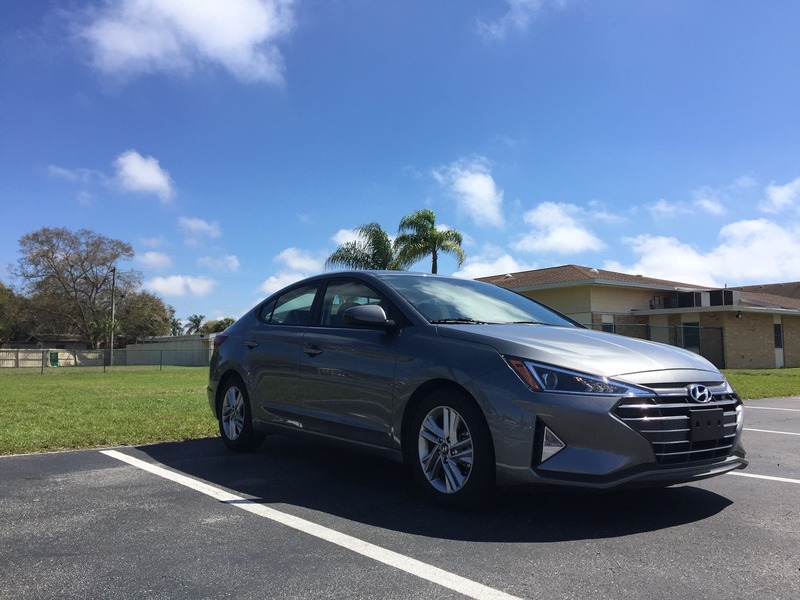 20,246 Hyundai Elantras were sold in the first two months of 2019 in the US, down 31.9% compared to January–February 2018. Good riddance. 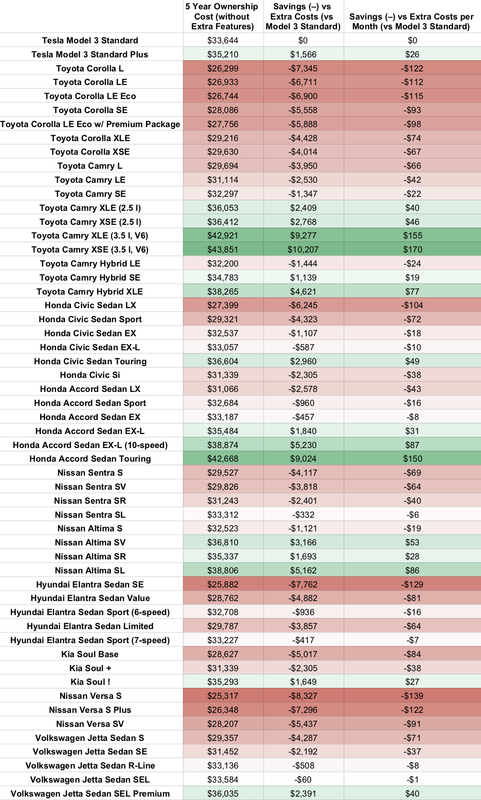 The Tesla Model 3 vs. the remaining cars in the top 20 would be similar, with the performance, safety, and quality of the Model 3 embarrassing cars with similar 5 year ownership costs and totally undercutting the cost of other premium sedans (which it also beats in almost all ways). These other best selling models include the Kia Soul, Nissan Versa, Volkswagen Jetta, Kia Optima, Kia Forte, Hyundai Sonata, Dodge Charger, Mercedes-Benz C-Class, Mazda 3, Subaru Impreza, Nissan Maxima, Dodge Challenger, and Mercedes-Benz CLS-Class. Find me one car on that list that competes with the Tesla Model 3 in terms of value for the money? Of course, you cannot. The main reason these cars continue to sell is societal inertia and lack of consumer awareness.